With Dark Angels and Tau getting recent rereleases, can the ever evil Chaos Space Marines be far behind? As a long time dedicated servant of the Dark Gods, I have a few ideas of what I’d like to see in the new book. These are not necessarily improvements that would turn the CSM into a tournament lock, but rather these additions would make them competitive, dangerous, and force them to live up to their own fluff as “the greatest threat”. The CC variant of Obliterators should be able to do more than just turn up and get shot to pieces. Such a great idea deserves far better rules and so here’s my idea: Mutilators get to assault the turn they deep-strike. It’s as simple as that. Make a rule and call it ‘Unrelenting Slaughter’ (or something like that) and give them the ability charge straight into the melee as soon as they pop up. These monsters need to be able to do more than just appear and get shot. Wouldn’t it be crazy if people actually took them!? Fabius Bile is such a cool character and yet people think of him as a ‘tax’ if they want to take his enhanced Chaos Space Marines. So why not have him as being able to confer FNP to any unit he joins? It’s not a huge leap (he is/was an apothecary), but maybe make the Rod of Torment more than a walking stick too, so that he can hold things up in CC as well, and he’d be a beast. Imagine him leading a group of 20 cultists, giving them that extra saving throw and being able to reliably take on challenges. Pretty sweet, eh? Giving Noise Marines an extra point of initiative is, well, a bit pointless. Ok, so you field them with close combat weapons but then they’re not really Noise Marines, are they? Find a fluffy way of giving them +1 ballistic skill instead and they’d be terrifying. All those sonic blasters and blastmasters hitting even more would make them truly devastating. And while we’re at it, give them a box set to have in stores as well! 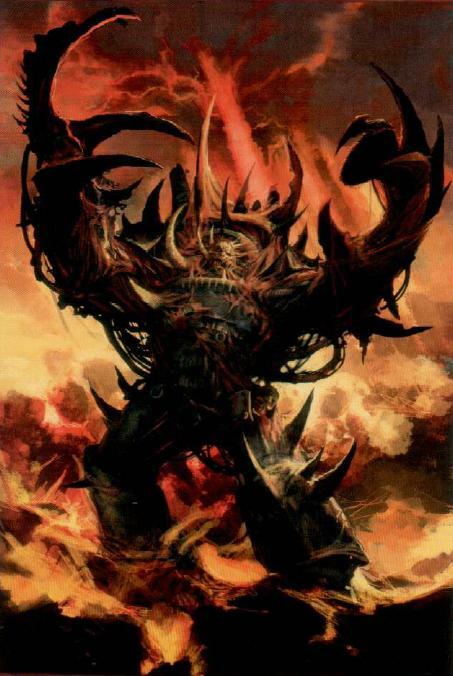 Yes, Khorne have their own big ugly guy with loads of huge guns, but what about the rest of the ruinous powers? We’ve seen corrupted Knight Households in the fluff, so let’s have them in the game too. I know Forge World have their own, but one in the codex will make things all the better for Chaos. A couple of unique weapons wouldn’t go amiss either. For any power-armour clad force, the Land Raider is still the pinnacle of transport with strong armour and firepower, and yet, while the loyalists get access to the Crusader (such a great tank), the traitors are still relying on their Twin-linked Lascannons to make a difference. It’s not a bad tank, but it’s not great, and for the points cost, you want something better than ‘meh’. How about a Land Raider sporting quad reaper cannons? Or some warp-born plasma nastiness? It would set them apart and lift them up at the same time. Winner. Marks for vehicles would be such a win. I was thinking of the Vindicator when I dreamt this up but this could work with all the others too. 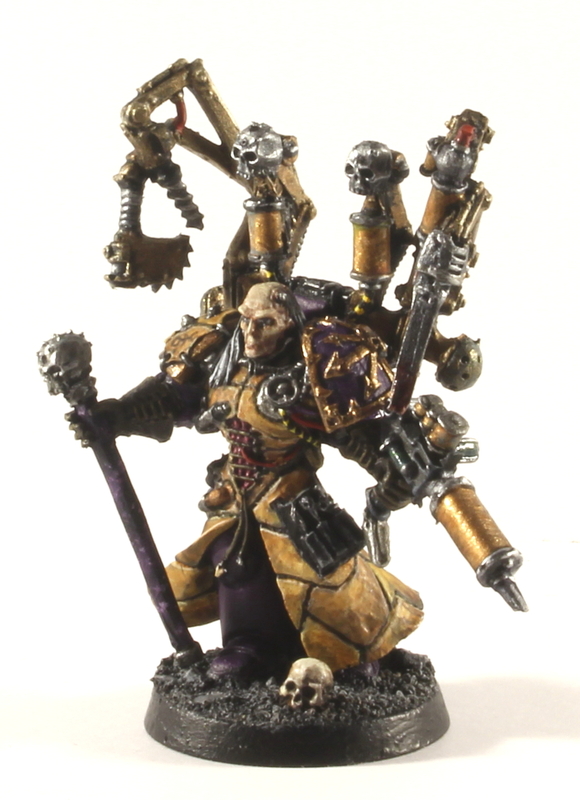 Imagine a Vindicator that had a main weapon that had a Poison profile for Nurgle, 2x the shots for Khorne, Vortex for Tzeentch and some sort of sonic boon for Slaanesh? Ok, so that’s not a perfect system, but getting something for a couple of extra points per mark would give these guys so much flavour. In his fluff, it says he never dies, so how about, any unit that kills Lucius, after a turn of him not being there he comes back as a random member of their squad? It fits with what he’s meant to be like, and would make him a truly formidable HQ choice. Kill him before turn 4, and you’re going to suffer. It’s the hot weapon at the moment, and the CSM deserve to have it as well. If you’re rocking Power Armour, you want this in your arsenal because, in many cases, it is the only way to stay competitive. And if they can’t have Grav for whatever reason (like they couldn’t nick it off someone?!) give them access to something fun like Volkite weaponry. That’s old, and Ad Mech already brought the rules over from 30k, so why not? It fits!! Chapter Tactics have been a great addition to the Space Marine book, so why not add them to the Chaos book? All vehicles in an Iron Warriors army get It Will Not Die. A Night Lords army can take Raptors as troops and all vehicle units gain Outflank. These are just ideas but you could get some real fun and flavour added into this book by just adding this simple mechanic. I never see these guys getting any table time (which is a shame given that it’s a pretty cool looking model). Maulerfiends get a little more action (a little more) but these guys are MIA and they’ve only been around in one codex! The plasma shots are as fraught with danger as any other, while the assault cannon shots are just underwhelming. Give them Grav arms, or missile/D-weapon options and they might crop up a little more. And that’s it (like that isn’t a huge ask). To make playing CSM a treat and not a punishment (yes, it really feels like that these days) again, you’d only need to implement maybe 3 of these rules. It would add variation and bonuses that the CSM book is crying out for. I’m hoping that the delayed update from GW means they get something really special, but I’m not holding my breath. I just don’t want to see Cultist Blob/Drake Spam/Obliterator Spam as the only option going forward any more. It can be fun, but if you eat nothing but vanilla ice cream, it gets to be pretty boring before too long. Which is unfair because Vanilla is a great flavour. You just need some variation. Chaos needs its Tutti Frutti. There are a few other things I could add in here. Not having to issue/accept challenges being one of them, but I’m guessing ever long-term CSM players have their own ideas anyway. If you disagree with any of these, or have your own ideas, stick a comment below. If another ‘dex comes out soon, let’s hope we get some real rewards. Until then; Onwards! ← Tau-velution – Where The Tau Have Come From, And Where They’re Going? For Noise Marines, what I kind of want to see is actually a change in the Base Rules. Make Salvo Weapons actually work like bigger Rapid Fire Weapons, so their Sonic Blasters get 3 shots out to 12″ and 2 out to 24″, regardless of whether or not they moved. That would also take a solid bite out of Grav. 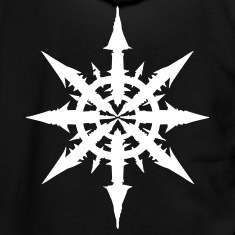 Berzerkers: Give ’em back their 2+ Chaos Armour from 2nd Ed, and the extra Attack on their Profile. Also, let them take a couple of Power Axes and/or Fists at Vanguard Vet costs instead of just the overpriced Plasma Pistols. 1K Sons: Ditch the Invul, give ’em 2 Wounds again. Maybe also have them generate an extra Warp Charge if the Unit is at 9 or above. Daemon Engines: WS and BS at least 4. Probably one more Attack for the MaulerFiend, maybe take the Hades Autocannon up to Heavy 6 for the ForgeFiend. 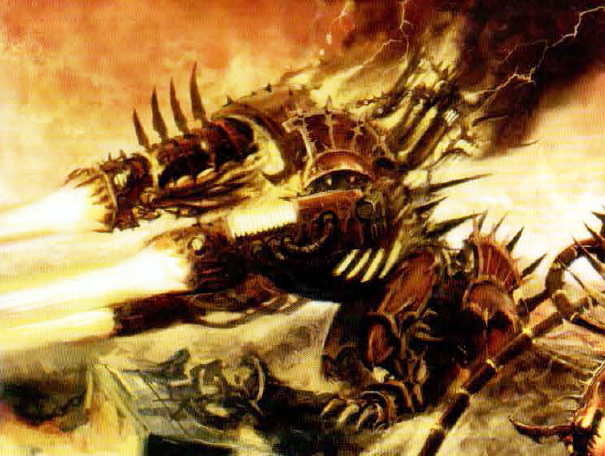 Give the Defiler some cheaper Weapon options like the Soul Grinder has, instead of always having to take the Battle Cannon and all the other Weapons that you can never use effectively because the Battle Cannon makes you Snap Fire them. 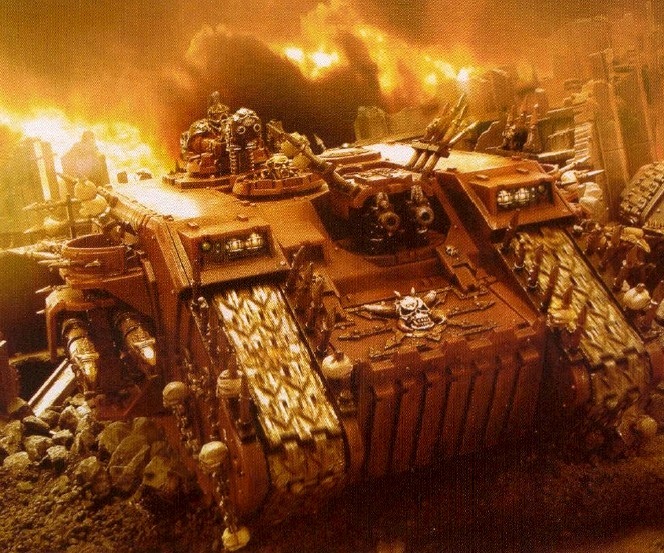 I’d like to see two Land Raider variants: a cheaper one that’s basically just an Assault Transport, with a larger capacity, and a serious gunboat variant, with something like TL Hades Autocannon in each Sponson and a BaleFlamer in the cupola or something. Also some sort of psuedo PotMS Rule to let them be effective on the move, but with some sort of twist to make it more of a Daemonic Possession sort of thing. OK, this got sort of ridiculous, I’ll stop now. Most people will have thoughts on this topic. I think the idea of Legion Traits or a similar mechanism gets right to the heart of things. A modest tweak that allows the different legion themes to translate to the table will be a great boon for chaos. “Chaos needs its Tutti Frutti. ” There’s a quote for the ages! Some great ideas there. 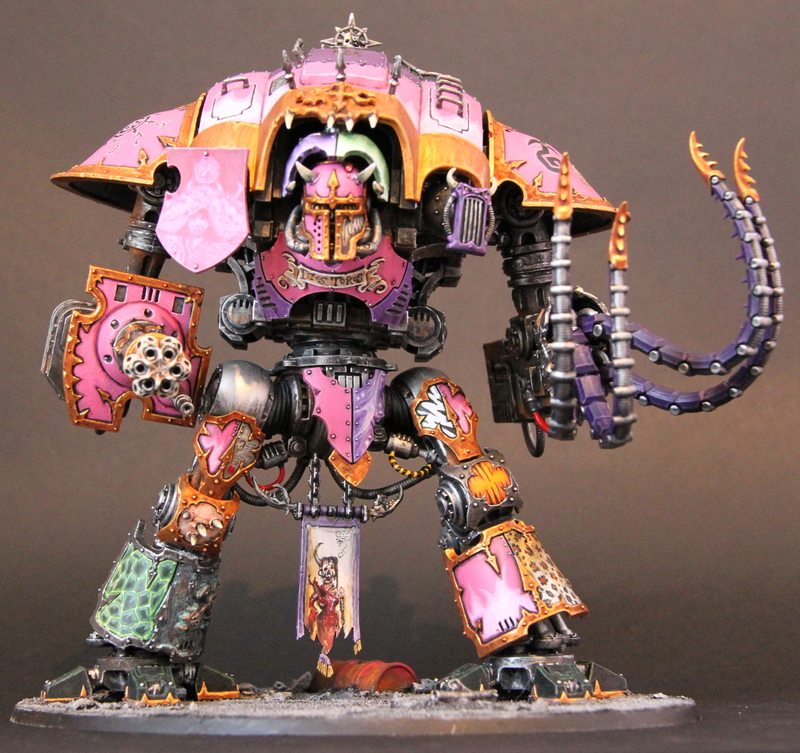 With Chaos marines there’s a balance to be struck between bringing in their heritage as former loyalists and making it very clear that this is now an entirely different beast. If the rules don’t push the boat out a little there’s a risk of them becoming just another style of Space Marine. Thus I’d be inclined to avoid things like giving them knights (even though I love chaos knights and I’m making one of my own) or grav weaponry (even though there’s no denying they’d steal them the moment they got out of the warp). On the later point volkite weaponry sounds more in keeping, or some kind of warp-powered heretek gadgetry. Having said that ‘chaosifying’ land raiders and other vehicles sounds like a great move. Perhaps some kind of upgrade sprue could be released with new weapons for each of the gods (sonic canon, chain-flail hurler, pus gun, etc). 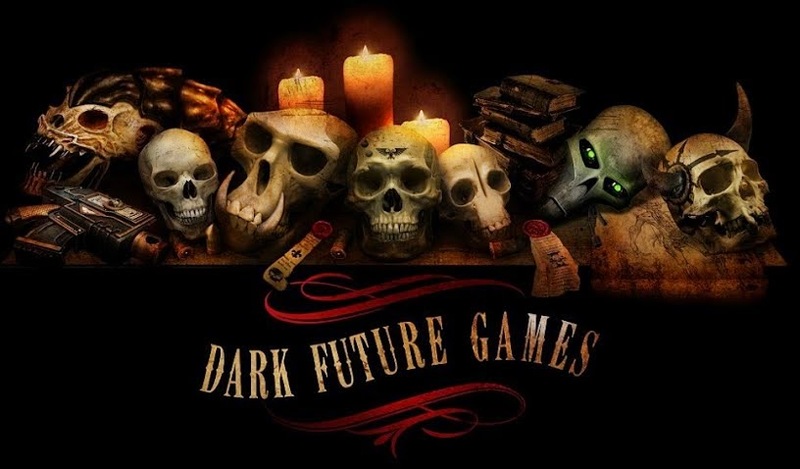 Another thing that could increase the unique feel of a Chaos codex would be greater emphasis on the cultists (and a perfect excuse to give them a boxset as well!) I’m not suggesting going as far as the traitor guard ‘codex’ produced by Forge World in IE13 but something to expand on the cultists by adding in a specialist or elite version would be nice. That way people could create cultist heavy armies that are a little less one-dimensional. I liked your suggestions regarding Bile, Lucius, Mutilators and Noise Marines (the latter two again crying out of new models – a Mutilator/Obliterator boxset with models that actually looked good would be a godsend). On and, like pretty much everyone, I reckon Legion Tactics sounds like a no-brainer. Continuing to sound like a stuck record but some more love for Tzeentch and Slaanesh in the model’s department wouldn’t go amiss either. Not that the official plague marines and berserkers aren’t showing their age as well but at least they can be effectively kitbashed with bits from the – now extensive – range of Fantasy counterparts. Come on Games Workshop, let me add the other gods to my armies in style! What about some love for the poor Warp Talons? Assaulting from Deep Strike would be great, but letting them use an enemy unit as a Deep Strike beacon (like their whole “excellent hunter” fluff indicates) would also be a good start – it’d at least make their blinding attack useful! Give every unit with the Daemon special rule Fearless. Daemons who can suffer from Fear when they look at their own squadmates or be terrified by petty mortal concerns is ridiculous! Warpsmiths having +1W and Sorcerers/Daemon Princes no longer having to generate a power from their god’s discipline would be good. Remember that they often fall for power – so why would they lose useful powers? I would either make the god-specific tables good, or just give them a free power from that table! Oh yes. Daemon Princes. Give them EW! They don’t even have an internal biology – they are the warp made manifest! They’re already pretty overcosted and don’t see the table much… This would help with making them as attractive as Lords or Sorcerers on bikes. Give Thousand Sons sorcerers the ability to reroll 1s when using Warp Charges. And make the unit itself cheaper – they are already pretty underwhelming as is! Give Plague Marine plague knives Poison (3+). These poor guys were his hard by the nerf to poison: losing their rerolls against T4 is a huge blow! And their I3 already didn’t help… This would make them somewhat more worth their points cost and give them a slight increase to their completely underwhelming hitting power. I would give Bile a Narthecium (or similar effect – FnP (5+) for his squad sounds good) and Rending with the needler and his “Torment” melee weapon. Maybe also increase his points by +5 or something? But really, I think that then he’d be prefect in his role as a good support character who can hold his own in close combat. New Land Raiders would certainly be great, but I believe they’re just letting FW take care of that. I love the idea of Legion tactics (and each one getting special detachments like the White Scars just got would be fantastic! ), and I completely agree with everything you said after Grav. Those are all great ideas! Thanks for the article!